Simultala Awasiya Vidyalaya Results 2018 For Class 6th, 7th, 8th: Bihar Simultala Awasiya Vidyalaya has Conducted PT admission test for a Students on May 20th across the state. Those people are willing to join in the school they have conducted exam to get entrance into 6th, 7th, 8th class sections. This year a large number of competitors have appeared for the Bihar SAV admission entrance test. This was the Pen-paper based examination attempted by all the Candidates applied for the admission in Bihar Simultava Awasiya Vidyalaya. 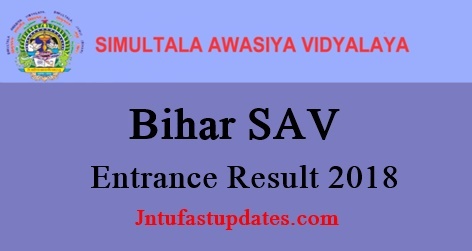 Students those whose exam competed for the Bihar SAV preliminary can download Bihar SAV answer sheet PDF for all sets and compare with the question and can estimate the results or marks to get into main examination. Students can check their chances to get admission in Bihar SAV by comparing with the answer key. Check the Below article for information about Bihar Simultala Awasiya Vidyalaya Results for 6th/7th/8th/9th Classes in the official website savbihar.ac.in and indiaresults.com. Simultala Awasiya Vidyalaya, Bihar offers the state level Gurukul residential education for the students. It has introduced the Guru and Gurumata ashram system in the state of Bihar. The Bihar SAV will give admissions for the students in 6th, 7th, 8th, and 9th classes on the name of trust. In order to get admission, students have to qualify the entrance examination with good merit list in the test. The entrance test will be conducted in 2 different phases, preliminary and mains examination. Almost all the people have written with their best efforts. Now its time for results from the board. Every people keenly waiting to find their results. So we will be post SAV Entrance test results 2018 release date and time once after confirmation with the bihar board. until keep checking below latest updates. How to Check Simultala Awasiya Vidyalaya Entrance Exam Results 2018, Merit List PDF Online? you will see the Results section in menu bar, then click on results tab. You will find the SAV Results 2018 title after declaration. Click on it and enter hall ticket number and date of birth, required details. click on submit then you will get score card. Download Bihar SAV Merit list pdf. सर मेरा रिजल्ट बताने कि कृपा करे ! sir mera roll no 5260281 hain please mera result batayeen. Sir Jab Maine Apna simultala ka question check kiya toh usme Mera 119 number aaya tha but result mein 98 diya gya hai .so, plz… mera real result btaea. I am selected for mains,mere pas total result h.I got 124 .